The Buddha's Birthday is an important day of celebration for Buddhists around the world. The holiday is traditionally celebrated in most of East Asia to commemorate the birth of the Prince Siddhartha Gautama. He is the founder of Buddhism, and is also known as the Gautama Buddha. The Buddha was born into the royal family around 563/480 BCE in Nepal. After six years of ascetic practice, Siddhartha attained full enlightenment at the age of thirty five. As a result he became known as Buddha, or the awakened one. He died at the age of eighty in India. The exact date of Buddha's birthday is based on the Asian lunisolar calendars. It is primarily celebrated in Baisakh month of the Buddhist calendar and the Bikram Sambat month of the Hindu calendar. The date varies from year to year in the Western Gregorian calendar. However, it usually occurs in April or May and in leap years it may be celebrated in June. The Buddha's Birthday is a holiday for both celebration and reflection for Buddhists. Celebration varies among the different types of Buddhists. Theravada Buddhists combine observance of Buddha's birth, enlightenment, and death into one holiday, called Vesak or Visakha Puja. Tibetan Buddhists also combine observance of these three events into one holiday, Saga Dawa Duchen, which usually falls in June. Most Mahayana Buddhists, however, separate observance of Buddha's birth, death, and enlightenment into three distinct holidays held at different times of the year. In Mahayana countries, Buddha's birthday usually falls on the same day as Vesak. But in some countries, such as Korea, it is a week-long observance that begins a week ahead of Vesak. In Japan, which adopted the Gregorian calendar in the 19th century, Buddha's Birthday always falls on April 8. Some commonalities in celebration between the different branches of Buddhists are the hanging of lanterns, enjoying communal meals, parades, and visits to temples with offerings. 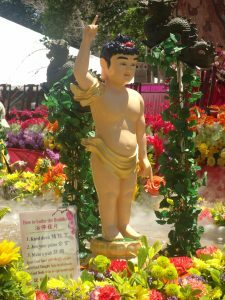 Another tradition that is observed is the washing of the Baby Buddha. Some Buddhists believe that when the Buddha was born, he stood up, took seven steps, and said "I alone am the World-Honored One." He then pointed up, to heaven, with one hand and down, to earth, with the other. The seven steps the Buddha took are thought to represent seven directions—north, south, east, west, up, down, and here. The ritual of "washing the baby Buddha" commemorates this moment. Typically, a small standing figure of the baby Buddha, with the right hand pointing up and the left hand pointing down, is placed on an elevated stand within a basin on an altar. People approach the altar, fill a ladle with water or tea, and pour it over the figure to "wash" the baby. Learn more about Buddha's Birthday with the books below.